A retired geologist in Baton Rouge, artist Charles G. Smith paints nature. After a long career mapping Louisiana’s dark subterranean world of oil and gas reservoirs, retired Baton Rouge geologist Charles G. Smith has turned his attention to painting in the wooded pastures of Southeast Louisiana, the mountains of Colorado and along the rocky coasts of California. His painterly images reveal an imagination freed from the geology of the land to the poetry of light and shadows. 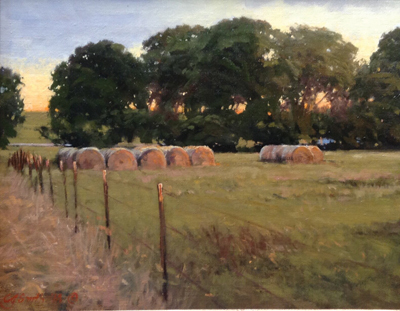 Smith’s studio and home are filled with his small paintings of rural landscapes. They are, in a sense, visual memories of earlier travels in the United States and Europe or simply impressions of cows grazing in a nearby pasture, or rolls of cut hay warmed by late afternoon sunlight along the River Road. Born in 1943 near a coal mining camp in West Virginia, Smith and his wife, Peggy, grew up in nearby Huntington on the Ohio River where they attended Marshall University. She studied math and he, geology plus a few art courses that interested him. Smith then went to receive a master’s degree in geology from LSU in 1969. With the Vietnam War then raging, Smith, like many of his generation, joined the Air Force and spent the next four adventurous years on military bases in West Germany. After his discharge in 1973, the Smiths returned to Baton Rouge, now with two young sons, where Charles went to work as a consulting geologist, specializing first on groundwater resources and then on South Louisiana’s oil and gas deposits. Smith is represented in Baton Rouge by Ann Connelly Fine Art and in New Orleans by Jean Bragg Gallery. For more information about his work and paintings, visit charlesgsmith.com.